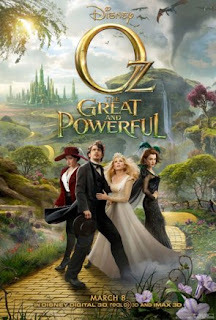 American fantasy adventure film "Oz the Great and Powerful," which is based on L. Frank Baum's Oz novels is the number one movie over the weekend. Oz the Great and Powerful raked in $80 million ticket sales. The movie was widely released in conventional 2D, Disney Digital 3D, RealD 3D and IMAX 3D formats. The movie stars James Franco as Oscar Diggs, Mila Kunis as Theodora, Rachel Weisz as Evanora and Michelle Williams as Glinda. For those who haven't watched the film yet, I won't tell who is the evil witch. To those who have enjoyed the film, Disney has confirmed already that the plan for a sequel film. Moving along the Box Office, former number one movies "Jack the Giant Slayer" and "Identity Thief" were number two and three respectively. Completing the top five movies are "Dead Man Down" and "Snitch." Here are top 30 movies for the week ending March 10, 2013.